We are fortunate at SFIS (Santa Fe Indian School) to have started up our own Café Scientifique New Mexico program site this past school year. 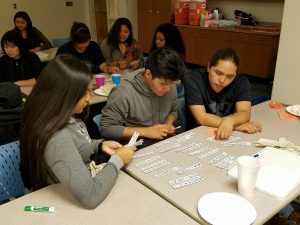 At SFIS we are also partnering with Santa Fe Alliance for Science, which until recently had their own cafés but weren’t as successful at drawing teens from the Santa Fe area. They assist us with stipends for each of our guest speakers as well as a $25 gift card that we give away at the end of the meeting to a participating teen. So far, we have held three cafés at our school and have served just our Native population. But, we hope to garner more participation from Santa Fe community teens in our upcoming cafés. Our student population at SFIS are very special in that they come from many of the 19 Pueblos located in New Mexico, as well as the Navajo Nation, Hopi tribe, Jicarilla and Mescalero Apache Tribes, and many other tribes from around the country. Kate with her teen leaders at SFIS Café Scientifique. 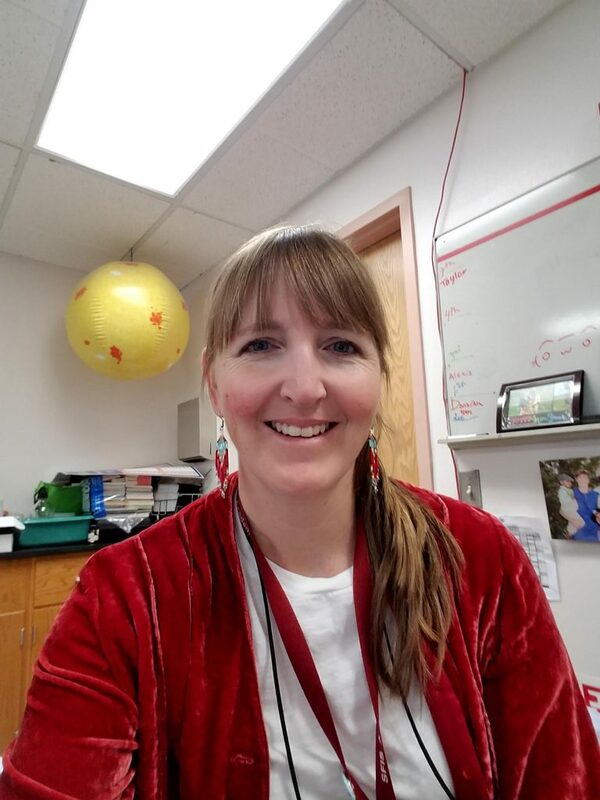 I was first introduced to Café Scientifique several years ago when Michelle Hall contacted me and wanted to see if our students would be interested in attending. I teach science at SFIS and found that these cafés were an excellent way to expose our Native kids to STEM fields and concepts. They were hands on and engaging, and had the kids thinking about relevant issues that affected their lives. For the past couple years, I had been taking students from SFIS to the Española café, which was held at Northern New Mexico College. The kids loved it, but as the driver, and I could only take 6-7 students from our school. Having our own café at SFIS, we can involve more of our dorm students and for the last three cafés we have held we have had over 20 students attend each one. The one challenge we are currently working on is getting more teens from the surrounding schools in Santa Fe to participate. That is where Santa Fe Alliance for Science executive director Diane Smogor is helping us by putting out the word and using her contacts in the Santa Fe Public Schools to inform teens about our café. We currently hold our café meetings in the Humanities commons room on the SFIS campus once a month on Wednesday evenings, usually from about 6:30-8pm. The cool thing about our location is that we have access to our Native students 24/7 because over 70% stay at the dorms. Currently ours is the only teen café in Santa Fe, but Café Scientifique New Mexico also has cafés in Albuquerque, Rio Rancho, Española, Taos, and Los Alamos. Our school administration has been very encouraging of our program and they have no problem with us using the space and equipment to bring great science presenters to our community. Teens work to solve puzzles at a recent café. So far, we have held three cafés at our school. The first was titled “Math Circles” with James Taylor. James had our students working on solving cool math puzzles, many based on the base 2-binary system, base 8-octal and base 16-hexadecimal. The students were so engaged and excited to be working together to solve these problems that they have invited James back in February to run another café. Our last guest speaker, Neale Pickett, a computer scientist from Los Alamos National Laboratory, also had our students solving puzzles, but these were code breaking activities on the computers. Neale and James both said they had never clicked so well with a group of students. Neale said “In my 8+ years of doing these, I’ve only ever clicked with a group of kids that well one other time. There were a couple of girls in particular that really reminded me of teenage Neale in how they approached figuring things out. There was talk about me coming back and running deeper into the content again this year with the same kids. I would love to be able to do that if y’all would have me.” Because of his comments and the excitement the students had for him we have invited Neale to our April café to work deeper with our students. I love that our students leave our cafés energized, excited, and confident about the experience they just had. I feel like our environment provides students a safe place to explore these concepts and engage with professionals and their own peers to learn new things. What is also really unique about the café program is that it is run by high school age teens. 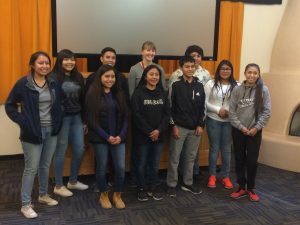 We have an amazing group at SFIS that attended a workshop last fall at Explora in Albuquerque to learn how to be leaders in this program. They help pick the guest speakers, plan the food that will be served, create the posters that announce each café, introduce the guest speakers, make sure the evening is running smoothly, and help with clean up. For other sponsors out there thinking of starting a café, make sure you bring in guest speakers that will provide the students with a rich hands-on experience. The guest speakers we have brought it were recommended to us because they had already done cafés at other locations for years and they had the experience working with students and providing rich opportunities. Also, make sure you have strong, motivated teens who will work with you to provide this amazing experience. As adults, it’s hard to let go of certain responsibilities, but if you trust your teen leaders they will surprise you! My main duties are manageable even as a full-time teacher and mom.